Welcome to my thread, fellow Geekhackers! After a lot of thought, I've decided to offer my services for keyboard assembly and modifications. Mostly as an excuse to do more of my favourite part of this hobby. Pricing will vary on a case-to-case basis, and shipping + materials are on you. My main tools are a Hakko FX-888D soldering station, and an Edsyn Soldapullt. Later on, I'm planning on investing in a small hot air rework station and other SMD tools, but for now SMD soldering will also be on a case-to-case basis. I will only be accepting 1-3 projects at a time, depending on the sizes of each project, and anything after that will go into a queue to be sure that I am not feeling rushed. This way I can give each project 100% of the attention it deserves. I will also not be accepting any projects I am not 100% confident in my ability to complete perfectly. I will accept orders from and ship them back to anywhere in North America (I'll even do EU or Asia orders, if you really want me to for some reason ). I am located in the sunny Okanagan Valley, British Columbia. On the slim chance that anyone from the Okanagan would like to arrange local pick-ups, that's fine by me. PM me for a quote! Payment through PayPal. If you're low on funds but really want something done, maybe we can work out a trade. Note: flux not cleaned off yet in these photos. Shots taken pre-flux-cleaning, nothing is scorched. Nice dude! Welcome fellow BC person! Let's see those build photos! Greetings and best wishes on your new venture from your neighbor on Vancouver Island. Photos should be up sometime this week, depends when I can borrow a half-decent camera again. Looking forward to doing my first project for someone! BC builder! Woot woot. Glad to see you are local. Hey was just wondering how much a switch swap for a Poker 2 would be? I don't have the switches, but I'd like my Poker 2 with browns to be swapped with clear switches. Never thought there were this many Canadians on this thread. I'm from BC too! I have an Atreus kit (+ Zealio switches) that I'm never going to have time to solder up and assemble. I'm curious, how much would a full-on Atreus assembly cost? How long do you estimate that it would take? I'd guess my turnaround time to be within two weeks to be safe, but most likely a week or less. I don't do sanding or finishing on the case though, woodworking is definitely not my forte. 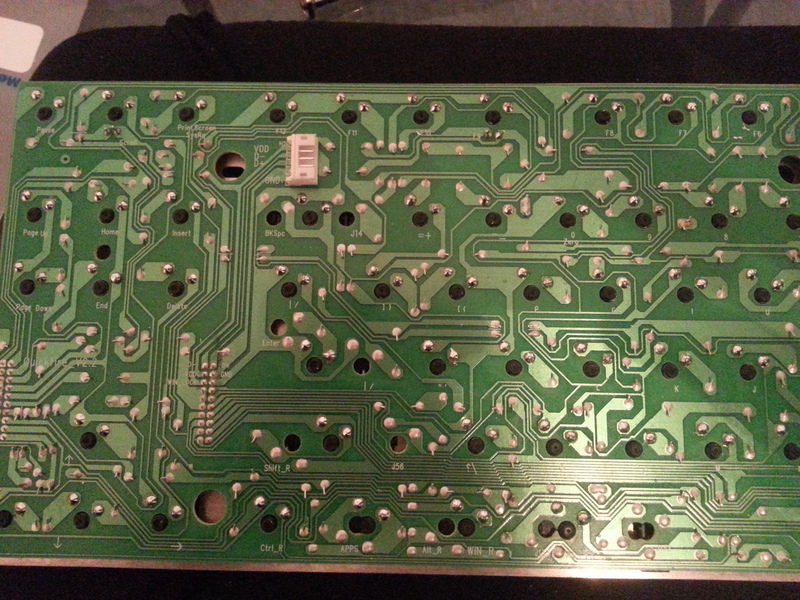 It looks like it would take four or so hours to build, so I'd say about $70CAD for assembly and solder, plus shipping. But Sifo, you're the Canadian keyboard guru! Ah man, I was gunning for the title of keyboard wizard. Can I be a keyboard cleric then? First client build received yesterday and in progress, more build photos to come soon (potato pictures though). Atreus, to be built with 65g tactile Zealios! 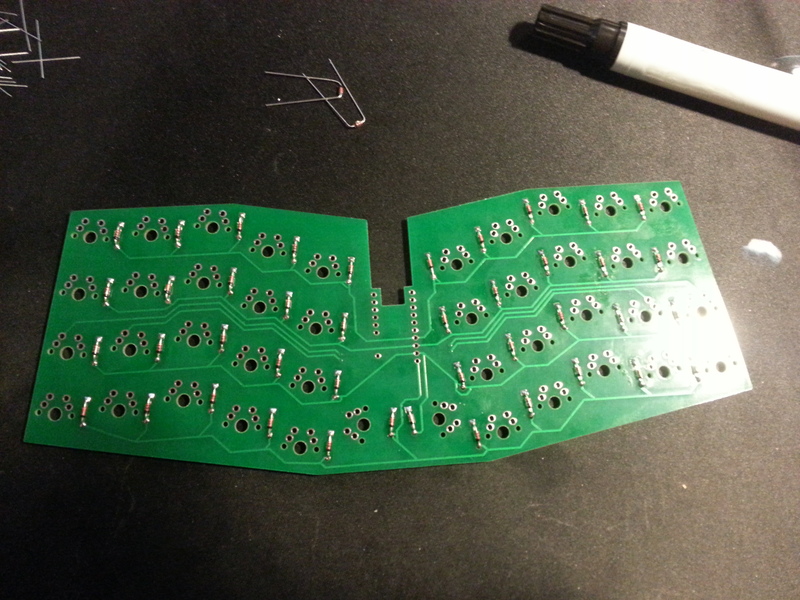 Diodes soldered up. It's a really unique board, I like it so far. The wood case is really nice! I'll keep that in mind, that wouldn't be good. 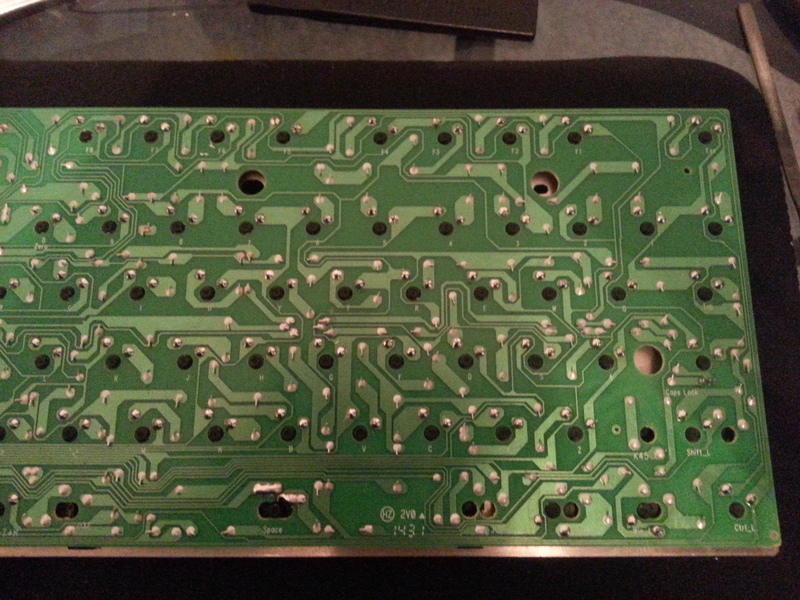 I'll be sure to triple check which way I have it before I solder in the switches and plate hahah. Atreus completed! There will be some more photos later, probably today. My Atrelio looks so dope! Thanks meow. Saved me soooo much time!! If you don't mind me asking, what is shipping looking like there and back? I may be looking to get some work done as well. I haven't done a quote for the way back quite yet, but bcredbottle could tell you how much it was on the way here! I'd be happy to take another order. Shipping back to bcredbottle came out to $17CAD. I don't know the price for the way here though. Cheers. Last few photos of bcredbottle's Atreus, now completed and shipped! It was a pleasure doing this build, thanks a bunch for the opportunity bcred! Meow soldered my Atreus up and I'm very happy with it! He worked quickly and was very responsive. He also provided pictures along the way. Very satisfied. Still looking for my next order! So, bit of an update here. Currently disassembling and reassembling a GON Crystal and an Orion for Gravenshard, so further orders will have to wait until after those boards are done. I will get to everyone else as soon as I am able! I really didn't want to have to make this post, but I'm getting a bit nervous since there has been a lack of communication. The last correspondence I received from meow a cat was on July 14, just over a month ago. Prior to this he was fairly responsive to PMs. On May 14, user merlin64 shipped the vintage blacks to meow a cat (who also purchased some from the same user). We discussed possible service options and pricing. A generous user, zanduby offered to send some LEDs to meow a cat for a side LED swap on the viper. Then he mentioned he was going through a rough patch and that he may not be able to work on my board when it arrives. "Hopefully by the time the board gets here, my life has settled down again. If not, I'll be open with you about any delays. Shouldn't be much though." On June 6, he notified me that both the Viper and LEDs have arrived, but that he had to go on an unexpected trip out of town for a couple of weeks, and that he will return on June 22 and will start work on my board immediately. The next correspondence received was on June 25th, and he told me he would be back in a few days. Then on July 14 (last correspondence received to date), he told me that he won't be able to work on my board for personal reasons. He also he could have it shipped to someone else who could work on the board (along with the vintage black switches I purchased). He even said that he needed a bit to get the cash to pay for shipping, but not to worry. I've messaged him three or four times since then, and have even offered to send him PP to cover any shipping costs so he doesn't have to worry about that. I have not yet heard from him. So please meow a cat if you can read this, I would really appreciate an update on a board that a friend sold to me for a very decent price :/ and to anyone considering his services - please be aware. I understand tough times, trust me, and I know keyboards are probably the last thing on your mind. But if you are running a service, have a thread dedicated to it, and decide accept to work on someone's board, I would expect and appreciate some sort of communication following the announcement that you can't work on the board and are willing to ship it back out. I'm not trying to witch hunt or call anyone out for anything yet (I don't know all the information or his situation) - I just felt the need to make my situation transparent as an attempt to eventually retrieve my board. TLDR: Sent Viper and vintage black switches to meow a cat at end of May/beginning of June. No work has been done to date. Last correspondence was July 14. He still has my board. Shows he was last active today about 20 minutes ago. Meow A Cat what the ****? Still alive guys. Life is ****ed right now. Everyone will be getting their boards back, I love you guys and I love this community. Working on this as we speak. I've had Gravenshards stuff for longer, but his stuff is half in progress so it's been a bit complicated getting it back together, I really don't want to forget anything. Hoping to get Mobbo's stuff back to him this week. Sorry this has gotten so ****ed up. it happens to the best of us... happened to me too honestly lol that's why i retired 5 times. gl man, ****ty situation for all parties involved. This is bs. One of my keyboards is within the stuff that gravenshard sent you. I was informed by gravenshard that you actually drove and met up with someone to give them their board back but you can't spend 5 minutes to ship things back. This is such a joke, it's almost been a year. What's even more messed up is that his keyboard is half finished meaning he has to send his keyboard to someone else to finish it but what if that someone pulls the same thing as you did? I don't get it. 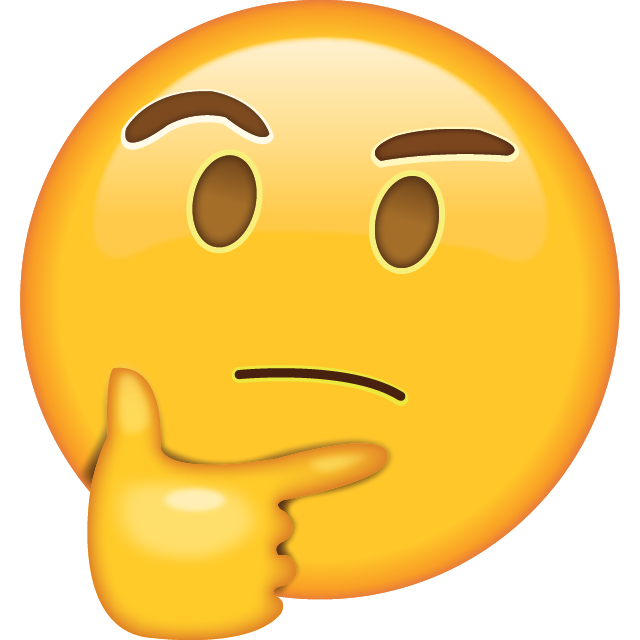 You send me a PM that you're going to send me my stuff back and then disappear for a month again without answering. I don't see how you can't spend a few minutes to send it back. It's already been over a year and you're basically holding $1000 worth of items. I don't mind sending him the money to ship it back if that was the issue but that can't be the case because he had it well over a year.